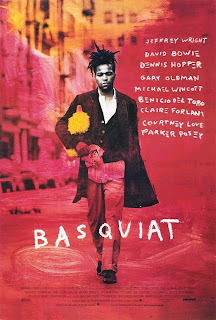 Several friends of mine have been encouraging me to watch the movie Basquiat. I had two different opinions prior to getting a copy of the dvd. My friend Joye hated it and told me, "any black person who watches this and isn't utterly offended is just . . . " she wasn't able to complete her sentence. Then another friend Michelle saw it and thought it was terrific. Joye is black. Michelle is white. I say this because I find it interesting how two people of different races receive a movie in such different ways. First all, let me tell you about Basquiat (just in case you don't know who he is). He was one of the greatest artists of our time. His rise to fame began when he was a graffiti artist tagging buildings around Manhattan. He would eventually become a household name in the art world and become a close, personal friend of Andy Warhol. He was claimed to be the first black artist of importance. He was also bisexual - although this truth about his life was not reflected in the movie. The cast of the movie is virtual who's who of entertainment. It has David Bowie, Dennis Hopper, Courtney Love, Jeffrey Wright and the list just goes on. I can't believe this movie came out in 1996 and I'm just now getting around to viewing it. But on to my opinion of the movie - I think both Joye and Michelle are correct. The movie is both offensive and fabulous. As a black man, there are definite offenses in the movie. Basquiat's agent at one point refered to him as "the voice from the gutter." What? Why does he have to be the voice from the gutter. Also, no one seemed able to accept Basquiat as a great artist. He was always referred to as a great black artist. In the movie Basquiat struggles with why his critics repeatedly did this. But this is the case for many great blacks (especially when we break into fields that typically have not be populated by black people). Tiger Woods is a great golfer. Venus and Serena are great tennis players. There race is not (should not) be an issue. There is a Catch 22 to this. For some reason it's offensive when white people refer to these individuals as a great black whatever. But black people (and I'm guilty of this) love to see other members of our race successful. So when these success stories happen I love to tell their stories and to elevate them as examples of what is possible. Oprah. Barack. Tyler Perry. These individual's stories are more powerful to me because they are black. So I love to tell and revel in the stories of these black people. Overall the movie is phenomenal for trying to tell the story of a great artist. But many great movies when disected have some truly offensive content. A couple of my all-time favorite movies are guilty of this. The Color Purple and Crash are movies that I LOVE. But if you aren't offended by some of the content in these movies then there is something wrong with you. I will actually encourage people to see the movie, just to learn a bit more about the life of Jean Michel Basquit. I think everyone (black, white, brown and yello) will walk away with something. It is a good story (even though they did omit the truth about his sexuality). How as the "truth" about his sexuality omitted? How do you know it was the "truth"? Did he tell you? Did he write it down? If your answer is no to both of those questions - you're making an assumption....we all know what those do.